The average organization receives 1,200 invoices every month according to the Institute of Finance & Management. What’s more, between 70 percent and 80 percent of all invoices in the United States are still paper-based. That’s a lot of information to keep track of – and a lot of paper to shuffle around. 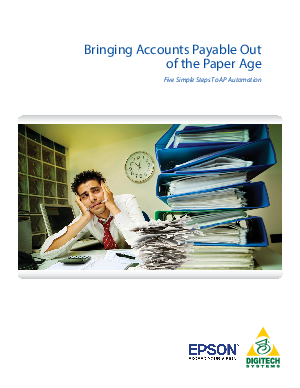 It’s no surprise, then, that 80 percent of businesses would love to streamline their accounts payable processes. But what stops them from doing so isn’t an overly complex, impossible-to understand process – it’s confusion about the unknown, and fear that automating AP will be time-consuming, difficult, and expensive. This report was developed to provide you with real, simple steps you can take to digitize and streamline your invoice processing. As you do so you’ll recognize significant benefits, including happier employees and a healthier bottom line.